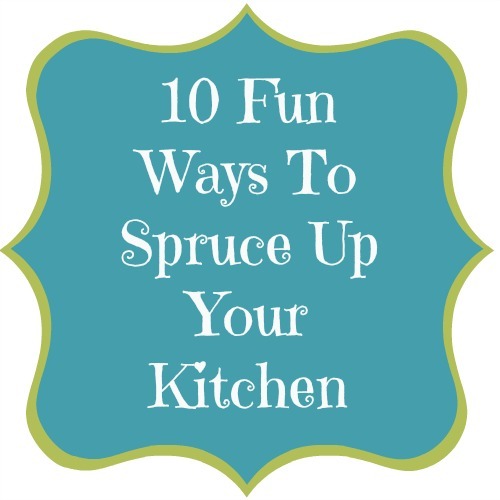 10 Fun Ways To Spruce Up Your Kitchen! I love my kitchen, but that wasn’t always the case. It used to feel blah to me. Now I stay in there as much as possible. Some people believe that a kitchen is just for cooking, and that decorating their kitchen really isn’t necessary. Well, I disagree. 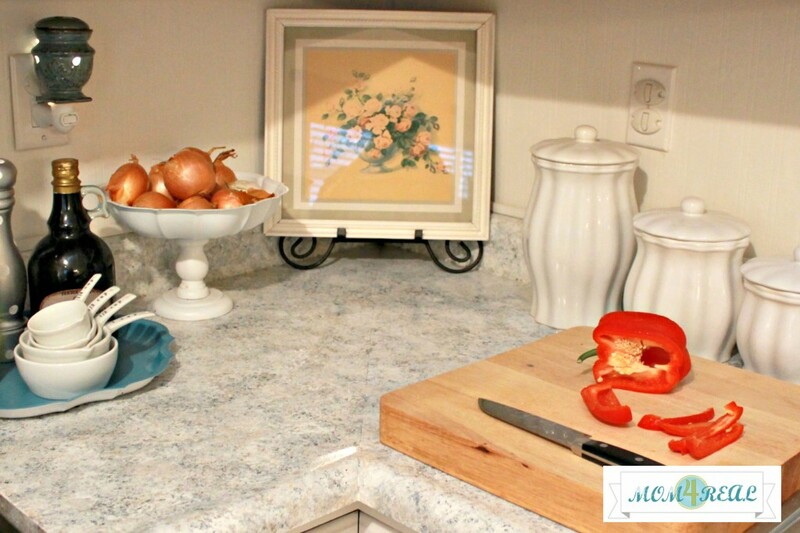 By making a few small and inexpensive changes, you can make your kitchen a place where you are inspired! For me, a happy kitchen equals a busy kitchen! Simply click on the images below to be taken to the full tutorial! Open up your kitchen cabinets! Take a few doors off of your cabinets and paint inside for a big pop of color! Make a fun chalkboard menu using an old picture or mirror! 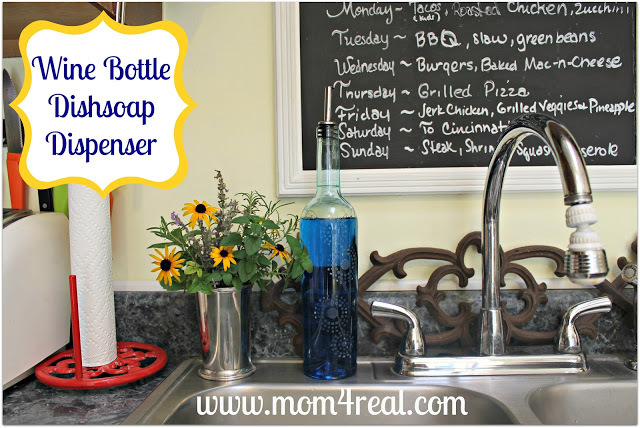 Put your dish soap in a fun container…I stenciled an old water bottle for mine! 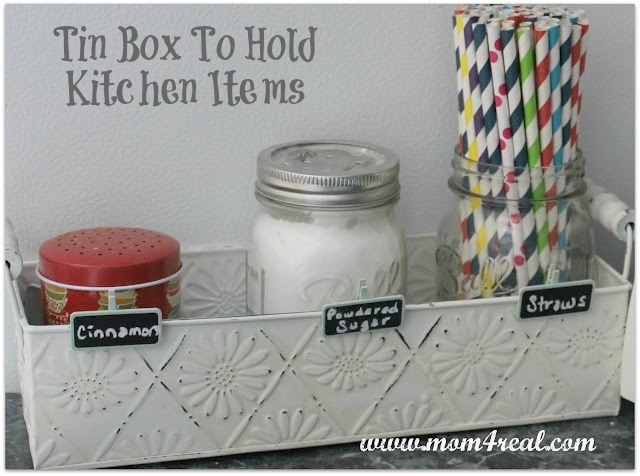 Store items you use often in fun containers! 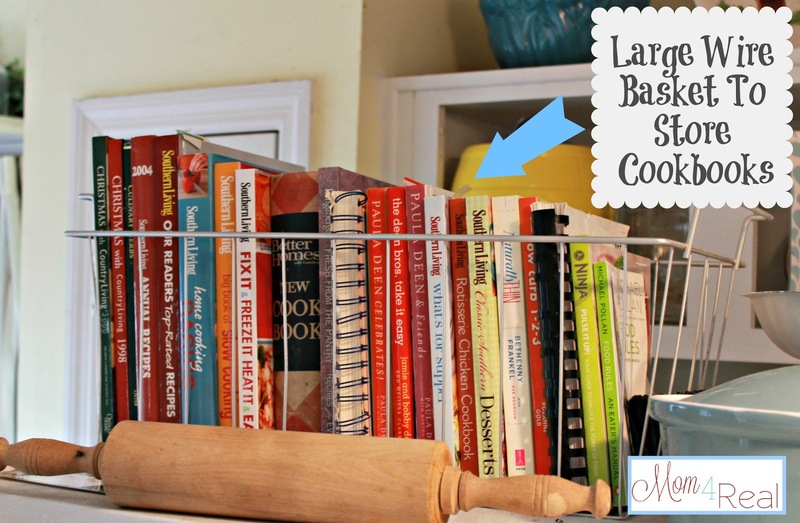 Store your cookbooks in a wire basket on top of your refrigerator! 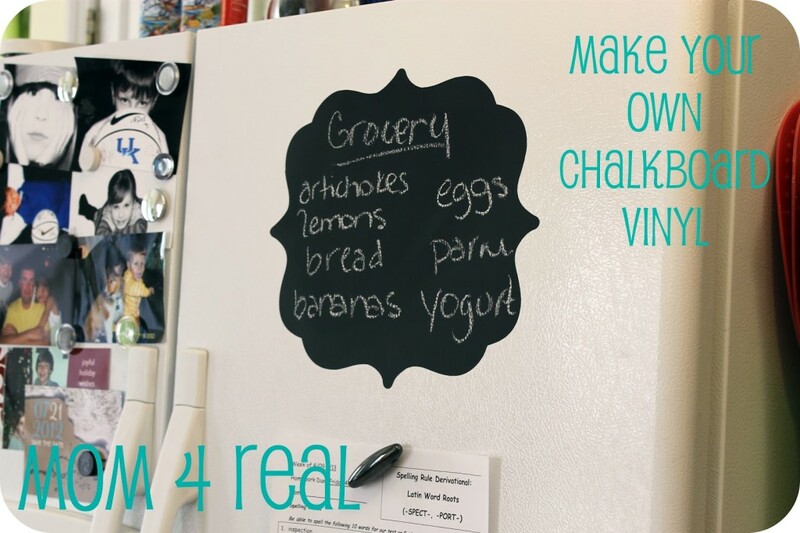 Make a vinyl chalkboard for your fridge to keep track of grocery items that you need! 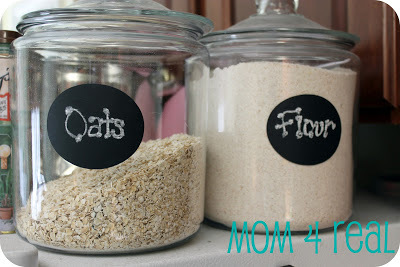 Make your own vinyl chalkboard labels for canisters! 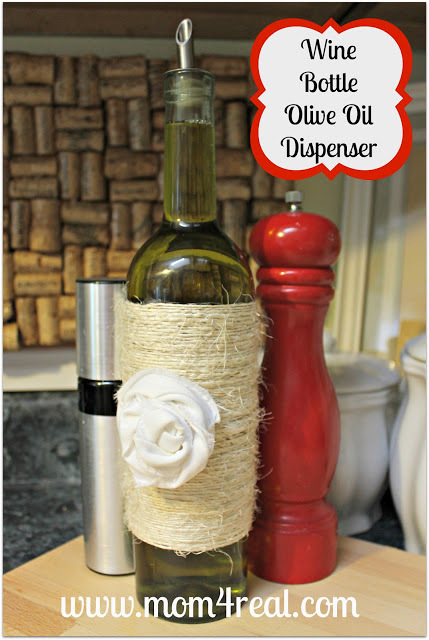 Use an old wine bottle to decant your olive oil! Just make your kitchen fun! Want to make some changes to your kitchen? Check out the video below to see how The Home Depot can help! Great tips, Jessica! 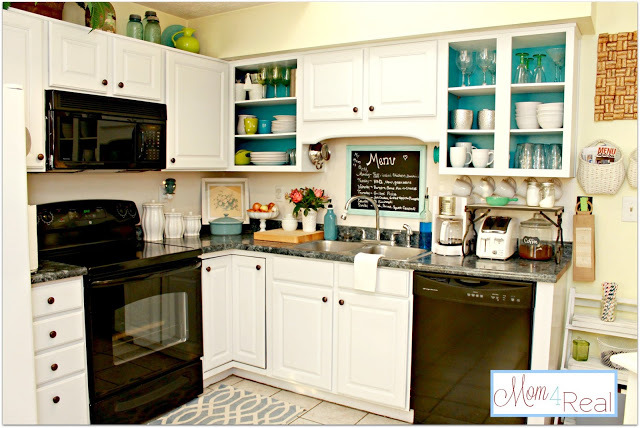 I especially love the idea of opening up the cabinets and giving them a pop of color! Thanks so much for the roundup! Love these ideas! Especially the ones with the cute jars! LOVE the winebottles…where do you get the lids for the soap and olive oil bottle??? Greetings! I’ve been following your blog for a while now and finally got the courage to go ahead and give you a shout out from Atascocita Texas! Just wanted to say keep up the fantastic work! Thank you so much! You made my morning! Your kitchen is so cheery and inviting Jess! Great makeover! Your kitchen is so charming. Great tips. 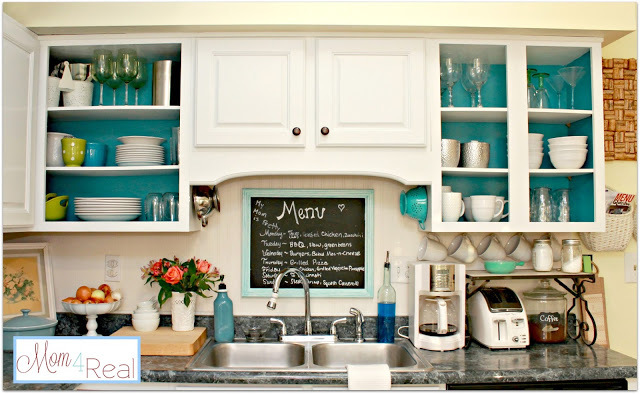 You have one charming kitchen…luv how you painted the bright color inside the open cabinets. Some pretty and fun ideas! I actually bought it at Target for around $10 :) It’s silver now…so, sort of turned into a DIY!